Illinois was well represented at the 2018 Federal Affairs Forum this year. Brad Anderson, PT; Angela Pennisi, PT; Kirsten Transue,PT; Jonathon Tsay, SPT and I brought our stories, concerns and requests with the legislative staff of both Senators and all 18 Representative districts in Illinois. We also thanked legislators for their past support that led to the therapy cap repeal last year. We met with questions and interest on the opioid epidemic. Though no legislation is complete, there are numerous discussions and policy drafts that seek to ameliorate the opioid crisis. If you have not already, share your patient stories and clinical insights with your legislators at the State and Federal levels. Request for changes to the PROPSPER Act, which currently adds arbitrary student loan caps and other damaging legislation to schools and students. Request for co-sponsorship and support of the Connect for Health Act (H.R. 2556/ S. 1016), which legislates PT and other provider care through telemedicine. Request that legislation to address the opioid crisis include the role of PTs in the acute and chronic treatment of pain. 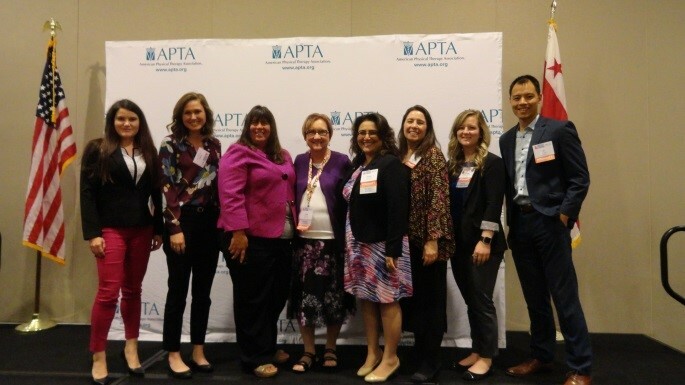 The PT Outcomes Registry was discussed as a meaningful outcome mechanism that APTA is developing in order to assist in addressing healthcare quality and outcomes. Here is a photo of the ANPT group. 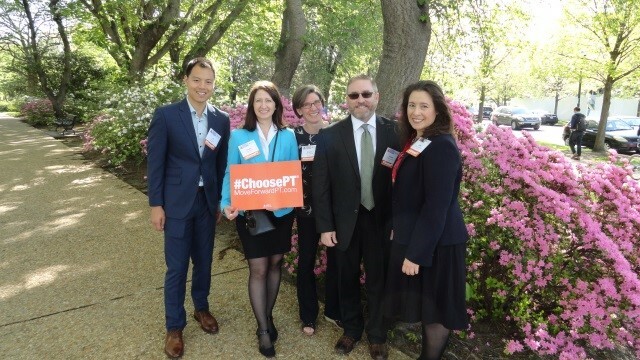 The 2018 APTA Federal Advocacy Forum took place April 29 to May 1. More than 70 students from across the US participated in the forum this year! Jonathon and Julie were also representing the Academy of Neurologic PT, and Julie was also representing the Section on Research at the Forum.